this day in crime history: november 29, 1933 | Nobody Move! 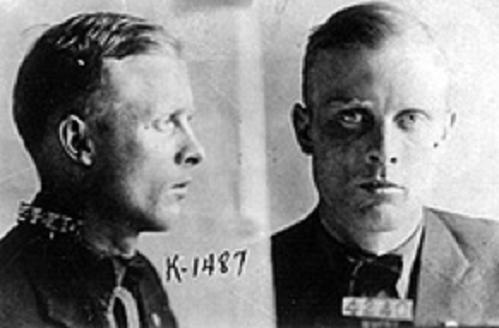 On this date in 1933, the bound and mutilated body of outlaw Verne Miller was found just outside Detroit, MI. Miller, the chief suspect in the Kansas City Massacre, was a decorated World War I veteran and former lawman. After a short stint as sheriff of Beadle County, SD, Miller turned to a life of crime. He started out in bootlegging, then moved on to robbery. Eventually he wound up as a trigger man for organized crime. The list of people with motives to kill him was long, but Miller’s murder was never solved. He was the most dangerous, of all the classic golden age outlaws. I never get tired of this story. Glad you post it today. Verne was definitely :something else. I read where he was a pretty good wheelman (had to be that law0enforfement training). I really need to see that Scott Glenn movie!